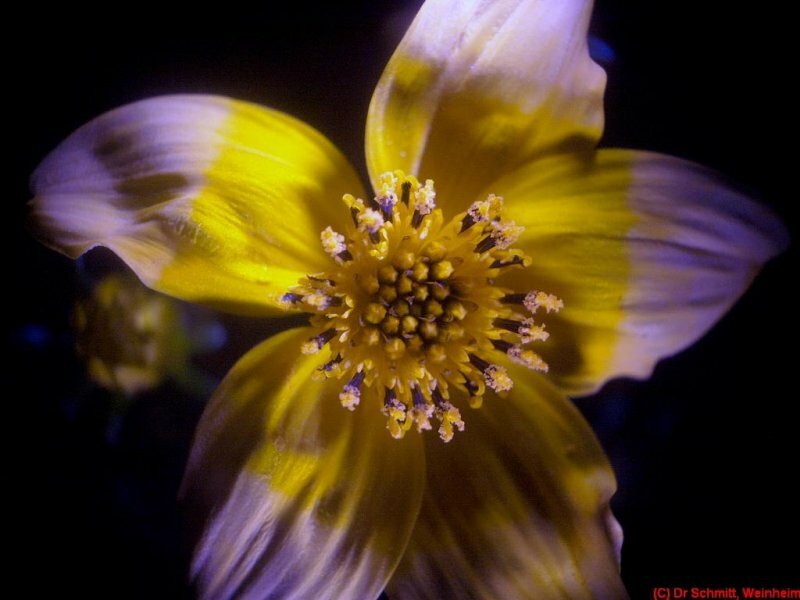 Bidens ferulifolia (in male flowering state) macro shoot using Carl Zeiss Jena UV Mikrotar and fiber optic flash light from the side. Used "bee vision" filter XBV2 to bring out the UV petal tip pattern in white (the flower is completely yellow to the human eye - well to nearly all of them). - well to nearly all of them. Klaus, I vaguely recall reading about this, probably on your site, but I can't find it again quickly. Do I remember correctly that some people have a variant S receptor that extends its range into the near ultraviolet? Can you provide a link to something that talks about this in detail? It is called "aphakia" and it is mostly known from people who have their lens removed. Excellent -- thank you very much for the reference! Google define: aphakia shows that "aphakia" refers specifically to the absence of lens, not UV sensitivity. All people who have had a lens removed have aphakia. According to Prof.Stark's notes, removing the lens allows even normal eyes to see UV that previously they could not, because of UV absorption by the lens. The new sensitivity to UV apparently does not have a name, or if it does, I've missed it so far. Edited to add: It's worth noting that in modern cataract surgery, a plastic lens is inserted to replace the removed natural one. The replacement lens may or may not be UV absorbing, depending on exactly what type it is. I recently learned that some have small hooks on them for muscles to attach to, so the focal length is changed much like a natural one. Presumably they can be made with various spectral characteristics. Is it useful to be able to see into the UV? human UV sensitivity has not jet a name (as far as I know), but there is information out which calls humans "hidden tetrachromats" and thet the CIE color model of human vision would not be complete without adding human UV vision to it. Well, it is just not yet fully described and defined I would say. Funny enough even WITH a lens still in place humans (some) have UV vision, maybe not as much as the ones with aphakia. They describe UV vision as being able to see a blueish white, which is exactly what I can see through my filter(s). Most replacement lenses are made of some sort of plastic I understand, so most of them are also UV transmitting in the 300-400nm range (at least 350-400nm). The usefulness is another question - but what should be wrong about extended vision and be able to also see UV patterns bees can see? To my taste, the bicolor is more attractive than plain yellow. Traditional color vision theory posits that three types of retinal photopigments transduce light into a trivariate neural color code, thereby explaining color-matching behaviors. This principle of trichromacy is in need of reexamination in view of molecular genetics results suggesting that a substantial percentage of women possess more than three classes of retinal photopigments. At issue is the question of whether four-photopigment retinas necessarily yield trichromatic color perception. In the present paper, we review results and theory underlying the accepted photoreceptor-based model of trichromacy. A review of the psychological literature shows that gender-linked differences in color perception warrant further investigation of retinal photopigment classes and color perception relations. We use genetic analyses to examine an important position in the gene sequence, and we empirically assess and compare the color perception of individuals possessing more than three retinal photopigment genes with those possessing fewer retinal photopigment genes. Women with four-photopigment genotypes are found to perceive significantly more chromatic appearances in comparison with either male or female trichromat controls. We provide a rationale for this previously undetected finding and discuss implications for theories of color perception and gender differences in color behavior. This paper falls a bit short of conclusively demonstrating tetrachromatic vision, but it does seem clear that something very interesting is going on. It also seems clear that the rate of occurrence for their results is a lot higher than 1 in 1,000,000. Subjects. Sixty-four University of California, San Diego, subjects volunteered through the psychology human subject pool for partial course credit, were solicited by advertisement and participated for cash payment, or were volunteers for research participation. DNA specimens from each subject were analyzed in a manner following existing research using standard procedures described in detail in Appendices A and B. On the basis of blind polymerase chain reaction (PCR) genetic assays, 64 subjects were partitioned into the six genotype groups seen in Table 1. Those 64 subjects included 23 "Four-pigment females (of heterozygote genotype)". As I write this, I cannot help wondering if tri-chromatism might be a faulty paradigm resulting from too many men directing the studies! first let me thank you for finding this very intersting study in its original form! And yes, maybe also too many males were involved esp. when the CIE vision standard was defined. The richness of diversity of fascinating material posted in these forums continues to amaze. This is one of the real gems. It would be really interesting to know how UV is perceived by those individuals, perhaps relative to the "visible" spectrum. Is it really different or is it, due to limitations of the brain's powers of interpretation, just more of the violet componet? Great that you like that Harold! UV may bee seen as whiteish blue by "those individuals", I can confirm.